Keep your head nice and warm with one of these highly fashionable and versatile personalised stretch beanie hats. Keep your head nice and warm with one of these highly fashionable and versatile personalised stretch beanie hats. Add that special one of kind touch by having a name, nickname, or club embroidered on it. Makes a great unique gift. 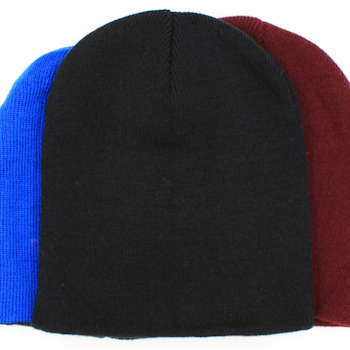 Keep your head nice and warm with one of these highly fashionable and versatile personalised stretch beanie hats. Add that special one of kind touch by having a name, nickname, or club embroidered on it. Makes a great unique gift. One Size fits most. High quality unisex stretch hat made from 100% double layer knitted acrylic in a fashionable style, can be worn with edge rolled up or down. Choose your embroidery thread colour and fill in the name, nickname or initials you would like. Please feel free to email us with any questions or ideas you may want embroidered. These items are made to order, please allow up to 48 hours for your order to be processed.